This past Saturday at Cal’s Spring Game. 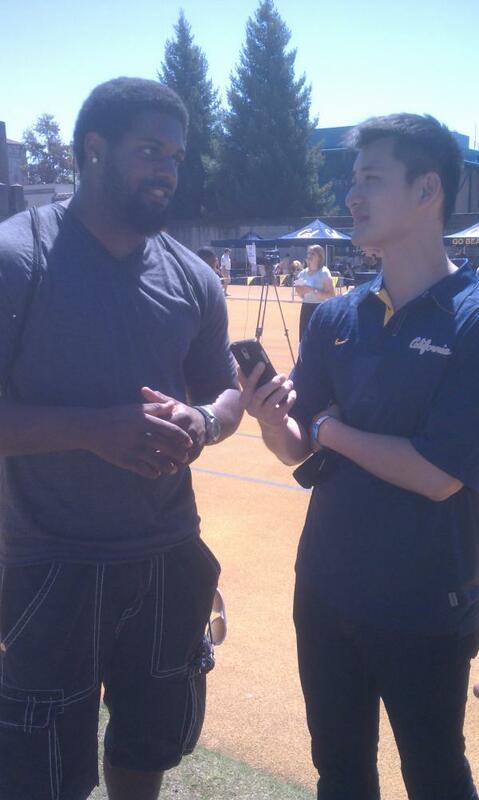 Cameron Jordan was gracious enough to give Cal Football Blog an interview while he was watching the game from the sidelines. I couldn’t get in all the questions I wanted to ask him but here is what I got out of him! CFB: What’s the difference between playing defensive line in college compared to playing defensive line in the NFL? CJ: Now its more like honing in on techniques. In college you can get away with just being more athletic than other people, but now you have to deal with 350 pound men that are sort of used to your speed and if not are a little bit faster. You have to focus more on your hand placement and more on your techniques and more on where you are driving and getting your power from instead of going out there every Saturday and rolling around getting after the quarterback. It is a little more studying. CFB: What’s it like playing against Drew Brees in practice? CFB: What’s it like playing inside the Super Dome? CJ : That is actually amazing. You think you’ve been to the Coliseum, you’ve been to Oregon where everyone is on top of you, but you get out to new Orleans and it is legitimately the loudest crowd I’ve been in. The stadium is closed not open and it has thousands of fans going absolutely bananas, and we’re talking about old ladies screaming and shaking their heads off. CFB: Who is the hardest offensive lineman that you played against last season? CJ: I’d have to say the left tackle from the Green Bay Packers (Chad Clifton), but that may be because that was my first game out there. I didn’t know the difference in tempo from the preseason to the regular season. They say that the preseason is just getting the feeling, but it has nothing to do with the speed of the game in the regular season. It is almost like transitioning from college to the league. [In preseason], you are like “I can do this. I can do this”, but then you get to the regular season and everyone is like two times faster than they are in the preseason. Only rookies sort of stay in regular mode while the veterans understand that they are out there in the preseason [not regular season] and will get better but they won’t break themselves over. CFB: Well thank you so much Cam! Thank you Cameron Jordan for the interview! I will have to make note to not take the preseason so seriously when deciding who to pick for my fantasy football team!